This is the second block, this time going over the cover hem and how to use decorative threads in your cover looper. We will be using our serger for our cover hem, and learn all about how to angle and do a crazy quilt block on your cover stitch capable serger. Pattern is included with class. 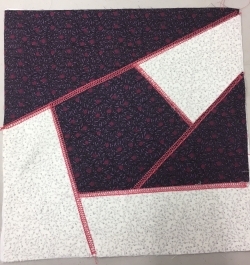 6 pieces of Scrap Fabrics to match your quilt, all 14" Square with applistick or other Applique Backing Pre-Fused.